When you’ve been playing guitar and singing the blues as long as Paul Plumeri, you learn to do things your own way. Naturally, since he does things his own way, Plumeri’s guitar playing and singing styles are distinctive. In a blues bar setting, where he’s often called upon to play tunes that have been done to death — a situation most blues musicians can relate to—Plumeri (pronounced plum'-er-rye) takes the standard, crowd-pleasing, familiar blue’s songs, items like “Sweet Little Angel”, “The Thrill Is Gone,” and “Red House” and makes these tunes completely his own. “Sweet Little Angel” becomes a medley of B.B. King tunes, while T-Bone Walker’s “T-Bone Shuffle” takes on a life of its own through Plumeri’s creative arrangement of the tune. 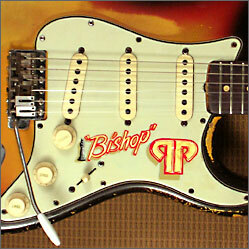 For proof of Plumeri’s technical facility as a guitarist and singer, one need only have a listen to his self-produced CD, “The Bishop of the Blues.” It opens with the shuffling instrumental, “Get On With It,” that is reminiscent of the great Texas blues guitar players, people like T-Bone Walker and even Jimmy Vaughan. Plumeri has an economy of style in his guitar playing. He may not play a lot of notes, and he’s never overly-flashy, but he certainly plays the right notes, ones that strike a chord of understanding with his audiences. Clearly, this is no ordinary bluesman playing the local “shot and beer” joints. One part technician, one part poet and one part guitar craftsman, Plumeri has been playing his own style of blues throughout the US for more than four decades. 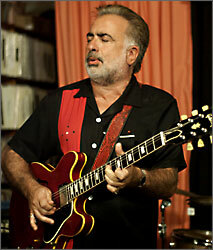 He’s been up and he’s been down, but like any good bluesman, Plumeri—still young by blues standards— perseveres. He remains optimistic about the future. Plumeri, the third son of the late well-known, well-respected, longtime Trenton-area politician and civil servant Sam Plumeri, began playing guitar at age seven. “When we were kids, we would play any place they would listen, from my parents’ living room when my brother would bring his friends over, to church things, to battles-of-the-bands and backyard parties,” Plumeri recalls. “I played with a drummer back then who was like four feet tall and very flashy, and his father was the type of guy who had him playing in bars,” he recalls. While his drummer’s father would shuttle them around to clubs, more than occasionally Sam Plumeri, Sr. would drive Paul and his band mates out to the clubs. “My dad, as busy as he was with local politics, would make it a point to bring me around to clubs when I was a kid,” he recalls. Plumeri’s uncle was a jazz booking agent and manager who worked with saxophonist “Red” Prysock and his brother/vocalist Arthur Prysock, organist Richard “Groove” Holmes and drummers Gene Krupa and Buddy Rich. Plumeri has early memories of sitting three feet from Prysock and Grant Green in the Fantasy Lounge in Trenton on Sunday afternoons. He recalls how thrilled he was to get up and play guitar alongside Hammond B-3 organist Richard “Groove” Holmes as a young teen. Plumeri got hooked on the blues about a year after he began playing guitar, when he discovered blues on the radio in Trenton. Longtime Trenton-area DJ and man-about-town George Luthre ("L-u-t-h-r-e, spell it right or we'll send it back") Bannister played a role in sparking Plumeri lifelong interest, in blues and classic R&B. After leading a succession of blues and rock bands through high school, he attended Mercer County Community College in the early 1970’s. At that time, the Trenton area and New Jersey’s clubs scene was still flourishing. Plumeri studied business but later dropped out. The monetary pressures were simply too great: he recalls making upwards of $1,000 a week in Garden State and Philadelphia nightclubs in those days. Through the early and mid 1970’s, Plumeri founded and led a band called Hoochie Cooch (taken from the Muddy Waters song, “Hoochie Coochie Man”) and played in that band until 1976, when he joined keyboardist Duke Williams in his band, The Extremes. The band was later signed to Capricorn Records, home of the Allman Brothers, Delaney and Bonnie, and countless other Southern roots-rock acts. With Williams and the Extremes, he toured the East Coast and most of Canada from 1976 until the end of 1980. The money was good, often more than $1,000 a week, but the band burnt itself out by the end of 1980. 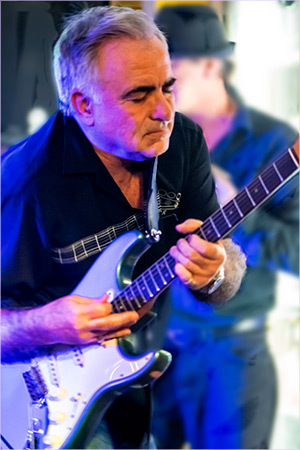 The first incarnation of the Paul Plumeri Blues Band made its debut on a Sunday night in 1982 at a nightclub in Trenton, the night Plumeri’s son was born. With a new addition to his family, a mortgage to pay, and the need for health insurance, he decided to change gears. He worked as a housing inspector for the city of Trenton. He still played blues at night and on weekends, as he does today. For guitar players, everything is about tone, and Plumeri figures he started developing his own tone and style when he was still in high school. “Somebody dug out tapes of me from the late 1960’s for one of these cellar jams which ware happening all the time, and this guy said, “You know Paul? You can listen to that now and you can still tell it’s you.” But my whole style developed because I was not a note-for-note copier. At the time, it was very frustrating, ’cause I wanted to play the whole solo on “Crossroads” exactly as it was played. “I would stylize it. I could sound like the player somewhat, but just couldn’t do the note-for-note thing. That turned out to be my biggest asset, ’cause I didn’t rely on that to be my vocabulary. I absorbed these people,” he says, referring to guitar “gods” like Eric Clapton and Duane Allman, “but I would not mimic them to the ‘t’,” he adds. Plumeri has been associated with the blues in the Garden State and greater Philadelphia for more than four decades, and frankly, it’s an affiliation he’s not willing to let go of. He never compromised his artistry for the sake of commerce, in other words, when suddenly, in the late 1970’s and early 1990’s, blues fell out of fashion for awhile. That is, until Stevie Ray Vaughan came along and brought everyone back to their roots. 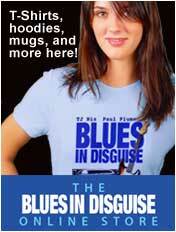 “I wasn’t willing to leave my association of being a blues musician. I never became associated with some other trendy thing, I did not play top 40 music.” Now, nearly three decades after the formation of the Paul Plumeri Blues Band, he presses on. And like any good bluesman, he’s ready to seize the right opportunity, but not necessarily the first opportunity.